Update 20120520: I’ve flashed the router back to the stock Belkin firmware because I was having stability issues with the DD-WRT firmware. The internet connection would regularly drop out a few times throughout the day even though the router stayed up and running. I also noticed the WiFi power in the DD-WRT firmware was significantly lower. The DD-WRT port for the Belkin F5D8235-4 v2 needs to mature a little more and have more bugs worked out but I thank the team and the developers for all their hard work. The Belkin N+ router (model number F5D8235-4 v2) is a pretty decent router as far as consumer equipment goes. I’ve usually built my own Linux based routers to use, but in a pinch nothing beats the simplicity and ease of setup of a commercial embedded router. The router does run a form of Linux – they have a GPL page called the Belkin Open Source Code Center that has relatively good archives of the GPL software they use in the router. People have had pretty good success sticking telnet into the build and reflashing the router to get remote access and dig around. The hardware is relatively well documented as well. It was only a matter of time before the guys behind DD-WRT ported over their powerful firmware over to the Belkin N+ – over at the DD-WRT forums is a rather long thread about the work and the porting process. Hop to DD-WRT developer BrainSlayer’s FTP dump to get the mini-image. You need the mini-image to get a base firmware of DD-WRT on there before you can flash the full image. The Belkin firmware does not allow you to go to the full DD-WRT firmware directly. Go this this FTP link, pick the year, then the most recent build, then the router (Belkin-F5D8235-4_v2), the pick “original-to-dd-wrt.bin”. Download that file. Flash the router by logging into the Belkin interface via the web browser. Go do a firmware upgrade and use the “original-to-dd-wrt.bin” file. Try to flash it over wired ethernet, not wifi and give it lots of time to finish. The last thing you want to do is yank the power cord or force a reset in the middle of an upgrade. After that file is flashed, you may need to refresh and renew your DHCP lease. Then log into the new router page via the web browser. Find your local IP address (example: 192.168.1.102) and replace the last digit (102) with 1. In this example, put “192.168.1.1” in the address bar. Set your password, log in, then reflash the the router again using “Belkin-F5D8235-4v2-webflash.bin”. Off you go, now enjoy your router with the power of DD-WRT! Go to this forum post by BrainSlayer and download the modified stock firmware. 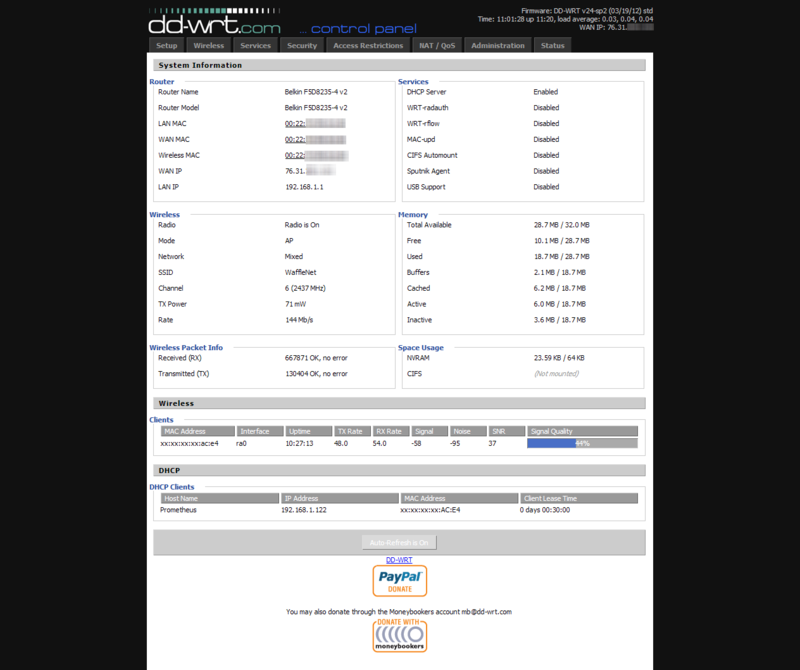 You need to be registered at the DD-WRT forums to be able to see the file that he posted. You can register here. For convenience, I have mirror the file and you can download it by clicking here. Once this firmware is loaded in the DD-WRT page, it will reboot into the Belkin firmware. For me, the Belkin firmware retained all of it’s prior settings. All I had to do was upgrade again to the latest Belkin firmware, double check my settings, and it was good to go again. You can find the Belkin firmware at this page. Did you find any of the information useful? Have I helped you save a bit of money / time / frustration? I've spent a lot of time taking pictures and meticulously documenting everything to post it here. I'd really appreciate it if you could send me some money via Paypal! This helps defray the cost of running this website and also provides me with beer to continue writing these articles. Thanks! You need to know that the default username and password to log in. When you set up DD-WRT for the first time, it will prompt you to create a username and password. Is my router toast? Any help? the new address to get to your router is 192.168.1.1 and the wifi name also has change to (dd-wrt) until you login to your router to change it. @Jesse: You probably need to use a LAN cable and set up your wireless network again. BTW Excellent instructions on making this a easy process. However I flashed my Belkin F5D8235-4 v2 but I am unable to get any of my LAN or WAN wired ports to work. Wireless works great and I can web and telnet into the router without an issue. I have tried multiple releases of the webflash and have the same issue. With that said, has anyone else had this issue and are there any solutions to my problem? I should’ve looked at your post, I ended up reverting but only because the router wouldn’t pull an IP address. I had the issue with the LAN as well. Did your WAN give you any issues? I have the same problem. Wifi work perfect, but lan port not working. I’ve had problems with lan ports with the original firmware from Belkin, I’ve been looking everywhere, but I could not find an answer why ports do not work. Latest 7/2012 didn’t pull ip through WAN. Used your mirror to revert back and my Belkin is running the Linksys interface v.7.50.2 and I can’t get the Belkin firmware to load “Upgrade are failed”. I have to say the router does work, although I currently have open wifi (no passwords) and want to get the proper firmware back on it soon. The issue your having is the same one i had last night. I found the answer and its maybe not what you want to hear..
good news, the ports DO work, the bad news is that DHCP commands do not pass across the bridge to the main AP. This means that the only way to have connections coming into the client bridge is to have a set IP address for every PC / phone / wireless laptop etc. I’m trying to find a work around but it looks like this is a long known issue and its a problem with the newer wireless drivers so dont hold your breath. You could try exploring WDS wireless which should give a totally transparent wireless network, i havent looked into this full so not sure if wired connections will work. Everything works great! I have 3 Belkin F5D8235-4 v2 with lastest dd-wrt version and optware installed. You need to pay attention that there are many versions of this router (v1 v2.00 v2.0x v3 v4), and this firmware is only for v2.00 of this router. Do not use this firmware with other versions because the switch ports controller changes beetwen versions. To unbrick your router, you will need a USBRS232 adapter with 3.3V TTL to access the bootloader os your router and upload a firmware using tftp. Very good post; I could install the DD-WRT firmware and revert it back easily just by following the instructions from you. Thanks! Has anyone used the newest version of the firmware (04/01/2013 as of right now) to see if the stability issues have been fixed? I’d like to try flashing my router, but I’m apprehensive unless I know it is stable. Please help, how to create torrent client?! After I downloaded the “original-to-dd-wrt.bin”, I was not able to access my router with 192.168.1.1 nor 192.168.2.1. I think my router is bricked. any solutions? Would anyone know if F5D8235-4v2-webflash.bin works on a F5D8232-4v2? Tested on my F5D8235-4 v2000 using the July 24, 2013 build. Got the same results as everybody else… wireless works great. Ethernet ports don’t. This includes both the local ports and the WAN port. According to the network stats, the router believes that it is sending out traffic to the WAN via vlan2, but is receiving nothing back. This is NOT simply a DHCP issue as somebody suggested. Ultimately, I was forced to revert to factory firmware. Newest build 12/24/2013 still has same issues, LAN completely unusable. Too bad. Reverted back to the Belkin firmware. The brainslayer ftp is now at ftp://ftp.dd-wrt.com/others/eko/BrainSlayer-V24-preSP2. Note the ‘ftp.’ in front of ‘dd-wrt.com’ which is what has changed and makes the link above not work anymore. How are you guys able to revert to the original firmware when the LAN/WAN ports don’t work to access the GUI? I tried reflashing via wireless but it never goes through and always end up with ddwrt. How is the dec 22, 2014 firmware?